Combine 1 cup of flour, 1 table spoon of brown sugar and a dash of salt mix in a food processor add in 1/2 stick of butter. Make a crumble dough. Press in to a lightly greases pan. Bake 10 minutes in 375 f oven(190c). In a mixer combine 2 table spoons of flour, 3/4 cup of brown sugar, 2 tables spoon of corn syrup, 1 egg, 1 teaspoon of vanilla and a dash of salt. Stir in 1 cup of chopped macadamia nuts and, 1/2 cup of shredded coconut. Spread this mixture on top of the warm crust. Return to the oven and bake 15-20 minutes. Let it cool. 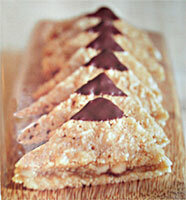 Cut into triangles and dop the corner into melted chocolate.